Hi everyone, got a Xsara Picasso 1.6 hdi and during a service found the timing belt had been shredding itself against the engine mount. Fitted new belts, tensioners, idler and water pump then watched the new belt run for a while and after a minute it started to drift off to create exactly the same problem. I put a straight edge on the sprockets and no surprise there's only three points of contact between the cam and fuel sprocket edges. My hunch is the cam sprocket is to blame as the centre bolt seems a bit eccentric but I've called it a day for today so not investigated any further. I'm not entirely sure where the fault is and have no idea what can be done in terms of correction, anyone had to deal with sprocket alignment on this engine? Thanks for any help. "there's only three points of contact between the cam and fuel sprocket edges." Can you expand on what you mean here. My initial thoughts are that the run out must be very small if it is taking a matter of minutes for the belt to move across. And that is not good news. You say that the cam sprocket bolt seems a bit eccentric. This is starting to look like the cam shaft bearings may have a problem. I hope I am wrong! 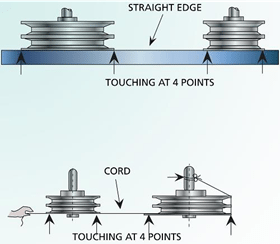 Hi, thanks for the reply - straight edge test for pulley alignment but the snag is the test is only relative to each sprocket so it helps if you already know which one is the prime suspect. The belt moves west after about a minute and begins to rub on the engine mount and to be fair I reckon it did 40k with this problem but obviously the cause needs to be found. I've yet to remove the sprockets (fun day making pulley holders) and looking at the parts hopefully one of them shows some obvious play or wear as there's no adjustment beyond replacing with a new part. Just thought I'd ask if anyone had come across this issue or maybe knew if one of the sprockets and pulleys was more prone to failure than the others. Well after some trial and error its back together. I shimmed a washer and placed it under the idler to point the belt back to safety, put the old tensioner back in then the belt stayed put for 30 mins while idling on the drive and that's good enough for a runabout with 110k. The new tensioner did not feel anywhere near as good quality and the hex socket had started to round out after a dozen refits but I think the problem was still the cam sprocket it does have a slight wobble on the orbit but its not getting anymore TLC at this point. I like how one section of the Haynes manual advises you to throw the crank bolt away and replace it while another suggests simply doing it back up to torque with some threadlock! You are totally right, the belt finally staying put for half an hour was a big win compared to it drifting off and having to make a sprocket holder with the chance the cam is bent anyway persuaded me to cross my fingers and see how this goes.